In a world where technology is penetrating more and more into our lives, where our hygiene and neatness expectations are growing higher and higher, where spaces are becoming increasingly sterile and even the most intimate spaces of our lives are computerised and synthesised, there is a greater need and search for the organic, for going back to nature, as the primary source of life. "We have a natural connection with living things, nature is something within which we flourish, so having it be more a part of our lives is critical, especially when we live and work in built environments." In our public spaces and buildings, we are trying to re-introduce a sense of space and light but there is still a need for that which has been lost - our connection to the natural world. In our new architectural spaces, it is not appropriate or effective to bring physical elements of the natural environment itself. There are some rather playful and impressive ways in which designers have attempted to either bring real trees and undergrowth into the office or to build offices within the natural environment, but generally these options are not practical, beautiful though they may be. Above left: Google HQ Offices in Tel Aviv. Above right: Architects Jose Selgas and Lucia Cano, have created this inspiring office building in the middle of the woods near Madrid, Spain. Still there is a way. This is where the visual artist can step in. The visual artist, being the “open eye” of the society, translating what they see into “language” of images to reach others, offers them ‘portals’ or gateways through which people can connect to the familiar natural world. The artist is the catalyst between nature, art and architecture. In our contemporary spaces, a relationship exists between art and architecture. We are increasingly presented with sharp images (i.e. billboards, advertising on public transport and most urbanized public spaces, and others), with their dominant messages which we are obliged to accept, leaving little space for the thought paths of the individual. Conversely, I feel that the viewer needs the freedom to ‘wander’ through each image and interpret it in their own way, to find what is familiar to them and to have their own dialogue with nature. The way I see it, a piece of work on the wall of a public space (here I do not mean those spaces which are especially designed to promote art, but rather working places, hospital interiors, etc.) is not to be imposed upon those who pass by but rather suggested, to allow them to take their time and contemplate and find their own place, or even give the choice to the viewer just to pass by. I find that nature, in everyday circumstances (apart from the cases of a natural disaster), has in itself the quality to remain in the background, to not impose. This quality of nature is something I have always tried to work with, to incorporate in my work and to convey to the others. Above left: Bilberry Hill, The Lickeys, 2012, Dominic Pote. 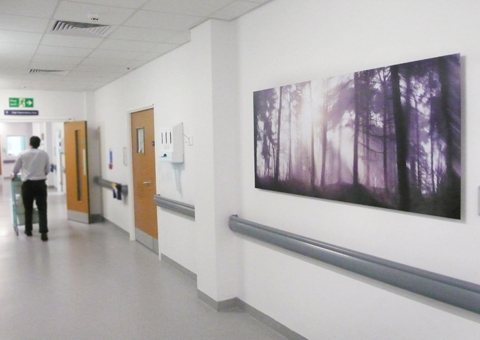 Installed in the Queen Elizabeth Hospital, Birmingham. Above right: Commissioned pieces for Experian offices in Nottingham, UK. Embankment I and II by Dominic Pote. My photographs are captured in motion, as I move through a landscape, recording on the film, using a continual exposure, that, which passes by in front of the ‘eye’ of my camera. Therefore they convey more the feeling of what it is to be in a landscape rather than how it looks. The images have a soft, gentle movement, alluding to painting as much as to photography. The photographs are presented in a contemporary format - large scale, flat, clean and without a frame or glass, but at the same time restoring a feeling of life, like a window back to nature. I want to both enhance the modern built environment but also to give back something of that which has undeniably been lost. Above left: Westonbirt Arboretum, Dominic Pote, 2010. 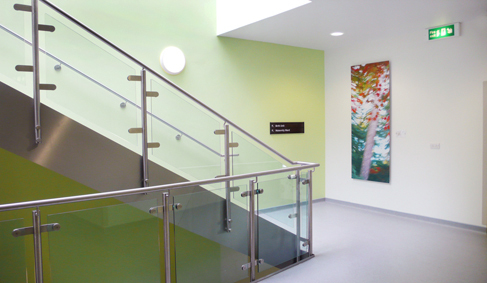 Installed in Gloucester Royal Hospital. Above right: Park Lime Pits, Dominic Pote, 2010. Installed in St Giles Hospice, Walsall. 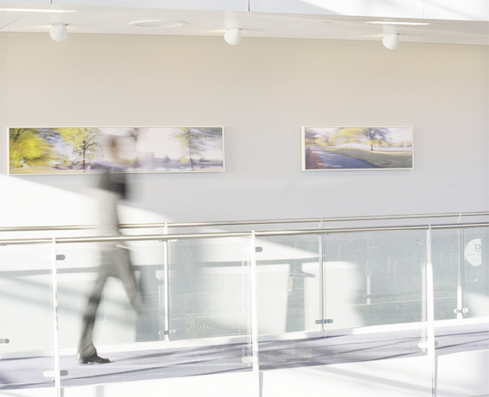 Research has been repeatedly carried out by universities, psychologists and healthcare institutions around the world and there is now a widespread acceptance that visual environment in healthcare buildings has a great impact on patient recovery. Natural light, colour and shapes from nature are gradually being recognised as important factors in our physical and emotional well-being and are re-introduced into health buildings and working spaces. Nature doesn't just have an effect on the mind. Roger S. Ulrich, PhD, director of the Center for Health Systems and Design at Texas A&M University, has found that nature can help the body heal, too. In his most well-known study, Ulrich investigated the effect that views from windows had on patients recovering from abdominal surgery. He discovered that patients whose hospital rooms overlooked trees had an easier time recovering than those whose rooms overlooked brick walls. Patients able to see nature got out of the hospital faster, had fewer complications and required less pain medication than those forced to stare at a wall. I believe that artwork for public spaces, offices and healthcare buildings needs to offer something universal, which would become a harmonic part of the interior design and also offer people calm and contemplation. Contemplative space helps both creative thinking in the workplace and the healing process in healthcare buildings.I want to offer something, which as nature does, simply fits gently in the background, but at the same time is so essential.